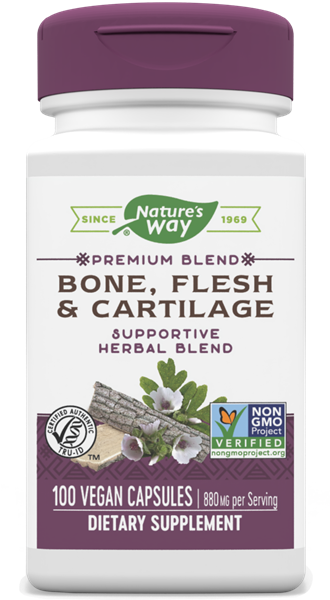 Bone, Flesh & Cartilage / 100 Caps - Nature's Way®. A balanced blend of traditional herbs. Take 2 capsules daily, preferably with food. For occasional use only. This product contains Slippery Elm. Slippery Elm should not be taken together with any medication as it may interfere with their absorption. This product is intended for short-term use only, not to exceed 6 weeks of use unless directed by a healthcare professional. Persons with allergies to plants of the Asteraceae (Compositae) family, including ragweed, should use this product with caution. If pregnant, nursing, or taking any medications, consult a healthcare professional before use. Astringent once used extensively by Native Americans and early settlers.